Ray, great podcast. I wonder then where temporal authority lies, as the script is flipped. It seems that orthodoxy (as is referenced by Roman Catholics, the Orthodox church, the Anglican church, and the loose confederation of various denominational and nondemonational Protestant groups) speaks to their authority. Religious authorities base their position as being from bible exegesis. This flipping the script is perceived by them as being an affront to their authority. The gatekeepers are upset that God’s grace is not in their hands to be distributed like the eucharist at a service or mass. To both conservative and liberal authorities God’s grace is filtered through them to the community. That is so wrong, but that is how theology has defined it to be (pick your own theology). The question is then with whom does the reality of God lie? Many preachers and pastors and reverends and bishops all claim directly or not a succession of authority that may or may be traced back to Peter, or they liken themselves to be prophets and don’t quite compare themselves to Paul, Elijah, etc. The Weslyan model respects tradition. Whose tradition? The winning side? 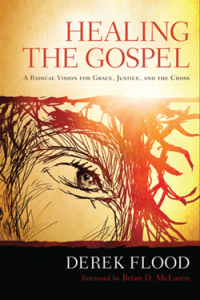 A new exegesis is necessary to rethink the gospel and as Derek puts it “heal” it. But, whose in charge? Why should I accept anyone’s authority, when today is it more about opinion or “expert” opinion? I don’t mean authority in a bad way, either. Maybe I should say who can I really trust?